By the way, shortly after she was photographed in her Anouk pinafore she threw up on it. 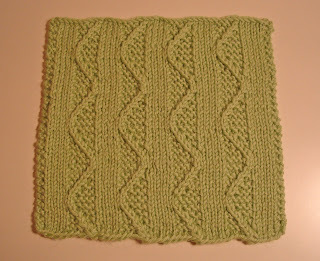 Next are the last few Learn to Knit Afghan squares I made. This first one is quite interesting. 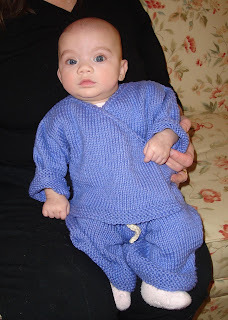 It is a slip stitch pattern knit on double pointed needles. 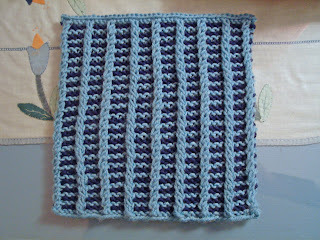 It looks quite intricate because, with two sided needles it is possible to change colors every row. Usually, each color is used for two rows because the yarn has to purl back from left to right after finishing a knit row. I think this was a clever invention. It looks more like stranded knitting than the other slip stitch patterns. 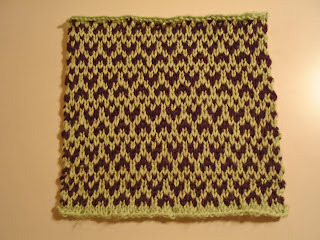 That was the last slip stitch pattern in the book. I really like the next section so far. It is twisted stitches, where you get easy crossed stitch effects without the cable needle. I love this pattern and would like to adapt it for socks if at all possible. The next one makes a cushy fabric. The lines running down it are twisted stitches standing out in relief because, well, because they are twisted. It would make a great dish cloth except it pulls in before blocking. I could make it a little wider.